A good friend of mine decided to give her dad a tenkara net (also known as a “tamo“) for Christmas. She’s been working on the branch frame for a few weeks and now it is time for connecting the mesh bag to the net frame. Yesterday she asked me for help with it but we couldn’t meet up. While I had put together this video years ago, I had since learned a better way of connecting the mesh bag to the tenkara net frame. And then I remembered I had some great footage from when I spent time with the famous tenkara net maker Yukihiro Yoshimura and his daughter learning the techniques for tenkara net making. So, I quickly compiled the most relevant shots of the steps needed in connecting the mesh bag to net frame. If you’re finding yourself at the point of connecting a mesh bag to your beautiful tenkara net frame, I hope this video will be of help. I also intend on putting together a number of “Quick Guide to Tenkara” videos in the coming weeks. 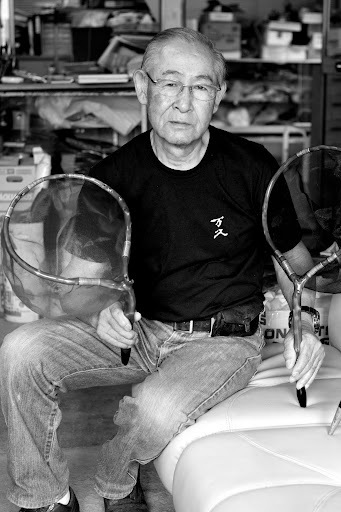 Yukihiro Yoshimura was likely the most skilled tenkara net craftsman the world has ever seen. With over 45 years of experience in making tenkara nets, he had honed his craft and mastered the skills needed in making consistently stunning “tamo” (or nets for tenkara fishing). Certainly the most stunning and well-made nets I have seen. Mr. Yoshimura was the heir of the Mankyu tackle-shop, a 5th-generation (about 250-year old) tackle store which he turned into a net-making business in the 1970s. 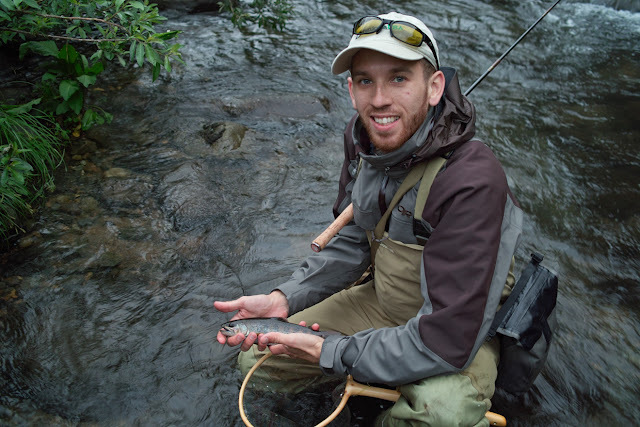 Tenkara Guides of Utah on the news! The guys from Tenkaraguides.com, Erik Ostrander, John Vertelli, and Rob Worthing, marked a new milestone for tenkara’s introduction in the US by appearing at the TV program KSL Outdoors with Adam Eakle. They told the story beautifully; the host of the show, Adam, did a great job at narrating it, and the video was very well edited. Kudos to the tenkaraguides.com and thank you to KSL for the interest in tenkara! Love the energy those guys are bringing to the community. As we near the end of fishing season and I looked for more things to do around here, I saw several branches sitting in the garage and decided it was time to resume my tenkara net making. Until earlier this year I spent a lot of time working on tenkara nets in my free time. I got about a dozen made and learned a lot along the way. Some were very exquisite, some I consider a learning experiment and a couple that I’m super proud of, like this and this. Then, time became very scarce, and I took a break. I was able to cut and work on a couple of branches when I was spending time in Japan. I also spent invaluable time with a master net maker in Japan, where I learned a lot that I have been hoping to put into use since my return. But, I just couldn’t find the time. Whereas last year I worked from a tiny corner in my office, this year I moved to a new place and found some space in the garage to setup a proper working area. I still don’t need many tools to do it, but this will keep my wife happy and my office much less dusty. I’m truly excited to get to work on them again, in a proper space this time. Soon after I setup my working area I had a chance to visit an area I knew to have the right types of trees – I use Jeffrey Pine – and a grove where many of the trees tend to have branches with the right shape. For an entire day I must have inspected every single tree in the area, and the work paid off with 14 new branches. These will not be considered nets for at least one year, as I now must remove their bark, steam them into shape, let them dry…splice their arms and join them, then sand, sand, sand, and finish. This should keep me busy for a while. People often ask me if I sell these nets or what will I do with them. Tenkara nets for me are just a hobby, a new passion that keeps me from having “down times”, something I don’t feel is work. If I’m bored, or a bit depressed, I just work on them and time goes by quickly. A couple have found themselves to the hands of people that earned them and I hope to give a few more away down the road. But, the main justification I have found for devoting to much time to this craft goes back to what my grandfather has always said to me, “knowledge is the only thing no one can ever take away from you.” It is very nice to have a skill, something that I can do with my hands and very few tools. Should the world go totally nuts I guess I can become a professional angler and trade fish and nets for other food and necessities. Yesterday I headed south to visit two craftsmen. The primary purpose of this trip was to visit the renowned tenkara net maker (tenkara tamo) Mr. Yukihiro Yoshimura, of the store “Mankyu”. You certainly heard about the tragic earthquake and tsunami that swept through Japan. I’m relieved to report that our tenkara teachers, friends and family are okay, but many others are not. In an effort to raise funds for the relief efforts that will be taking place in the coming days/weeks/months, I am auctioning off one of my very prized and extremely rare tenkara nets (tamo), made in Gujo by tamo master Ikichi-san. I feel greatly indebted to the people of Japan for teaching me about tenkara, and for always kindly welcoming me. 100% of the proceeds will go to the relief efforts. I have written extensively about tenkara nets here https://www.tenkarausa.com/blog/?tag=tenkara-net. I thought you, or someone you know may like the opportunity to acquire this one. 100% of the money raised will be sent to the relief efforts, and the bidder earns a one-of-a-kind net that is becoming rarer by the day. Please pass it on to anyone you feel would like a chance to bid. Good luck with the bidding and than you for helping. It has been a while since I last posted som ething on tenkara nets. So, I thought I’d give you an update on nets that I have recently finished. Also, be on the lookout this year for more on tenkara nets. I plan on talking more about them, and the advantages they present for stream fly-fishing, particularly mountain stream fly fishing. 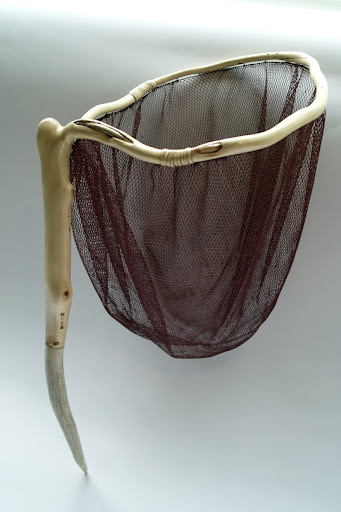 This first net was made with a Juniper tree branch, collected in Colorado. It is one of my favorite ones so far. As with all nets, this was a whole lot of work, but the beautiful features on the wood made it all worth it. I also incorporated a deer antler, which I thought would really complement it – and protect me in the water as Japanese superstition goes. As I didn’t want to hide the flaws on the branch, I chose to fasten the mesh to it by using eyelet pins on the bottom of the frame – TONS OF WORK, and I don’t plan to do that unless absolutely necessary as I felt it was for this one. As with all nets I’m making, this one features my name with Japanese kanji characters on the handle. Dr. Ishigaki, my sensei, is also quite a master with words. He was able to find characters that can not only be pronounced “Da ni e ru”, as you’d pronounce my name in Japanese, but also mean “a person who developed his own casting style” or something to those lines. 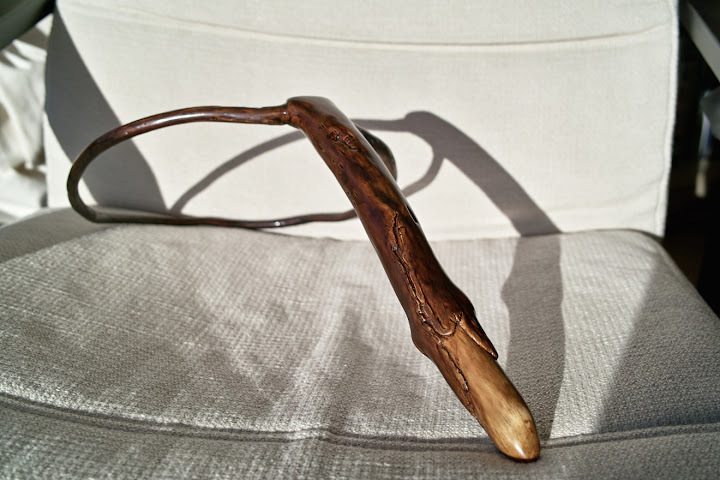 The one below is made of a Ponderosa pine branch, collected in the Sierras. I made the hoop larger than most other nets so far. It is a little over 27cm (most that I make are 24cm) in diameter. This one is a small net, made with Jeffrey Pine. The diameter of the branches making the hoop are thinner than usual, but it’s very strong nonetheless, and I’d use it with full confidence. 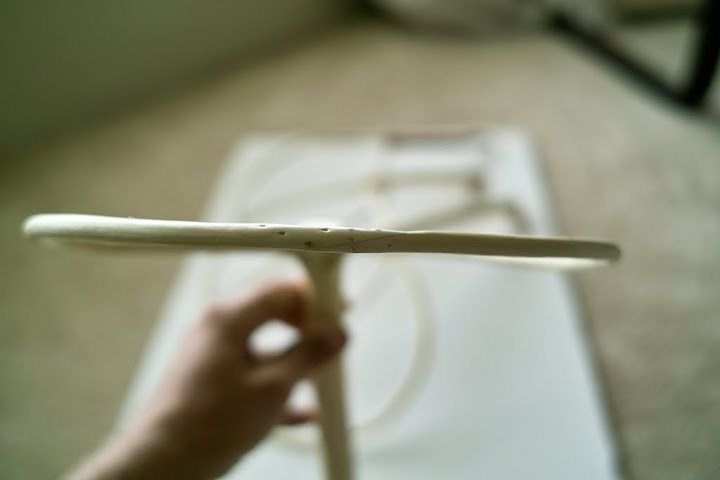 The line used to connect the mesh to the frame was twisted polyester line made by my friend and forum user Rick. And, below is the “kuroi tamo”, a unique black net. The branch had some parts with interesting lines and features, but was generally boring and not that pretty. Thus, I decided early on to highlight the interesting features by darkening the entire net and having a transparent, and golden tone over on black on those features. They are hard to see in the photographs, but the bottom of the handle and the rounded middle are where you can see it. Unfortunately I think the mesh bag was too small for this one. I was going for a smaller mesh to keep its look more “delicate”, and used a 24cm size. I should have used a 27cm mesh, and will probably change it down the road. Tenkara tamo, the experiment continued! I have been having tons of fun searching for the appropriate branches and then embarking on the adventure of making my own tenkara tamo (tenkara nets). As stated, I have fallen in love with tenkara nets! After spending a few weeks looking for the ideal branches, I was able to find a couple of branches, one from a manzanita bush, the other from the Jeffrey pine. After near a month in the making, I’m getting close to finishing them. The entire process was documented on the forum. Here are the semi-final results. I loved working on something so simple and aesthetically pleasing. It’s not easy, but doable, and beautiful. The details were difficult, especially joining the two arms of the frame. Though all nets are unique and one-of-a-kind, the manzanita will be more so because the manzanita does not have the symmetrical branches with the right diameters and angles for a net. The Jeffrey pine, on the other hand, has the ideal shapes and the wood is easier to work with. I’ll venture to say this is the first manzanita net frame in the world built in this manner, and after studying the manzanita I think it may continue with that title since it was almost impossible to find the right branch for it. It’s my most rewarding project, the wood is absolutely gorgeous, and the outer layer of the stripped bark is red, giving it a beautiful natural color and providing for very interesting patterns on the places I needed to strip and sand. I needed to cut the end of the handle as it was curved in the wrong direction, and I figured I could follow the tenkara tradition of using deer antlers for protecting who uses it in the water. A tenkara enthusiast, who also gave me some great advice, offered to send me some deer antler, and one of them was a great match, having almost the same colors as the wood itself. Stay tuned for the final pictures in a couple of weeks. I told you, I have fallen in love with the simple, organic elegance of tenkara nets. Though I have very little experience with wood work, I have decided to embark on the journey of making one. I have spent weeks looking up at trees trying to find the perfect branches to make a net myself. The branches needed to have just the right angles, the right diameters, be on the right (i.e. healthy) tree, in the right (i.e. legal) location, and be the right wood for this, that I just thought it was going to be impossible to ever make one myself. I finally found a couple of branches that just may work, and if nothing else are good places to start the learning process. 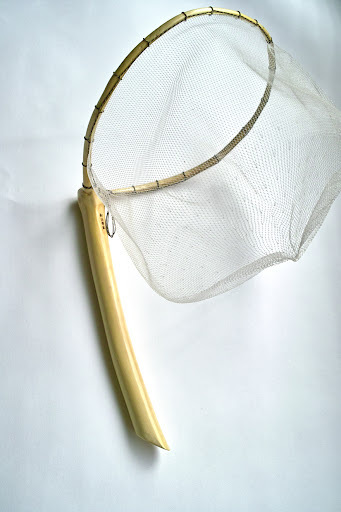 Through several resources accumulated and the suggestions of people with experience in wood work, I think I may just get to make my own net. I am documenting the experience on our forum, under the newly created category of “tenkara nets”. I was able to find 2 branches of a Jeffrey Pine (this yielded 4 possible nets) and one branch of a manzanita (above). So far I started drying the nets while forming them into shape with strings, removed the bark and did some initial carving on the knots and ends. Now I must let them dry for a while before resuming the work. The raw net frame assembly. This is going to be a real fun project. I have absolutely fallen in love with tenkara nets (tenkara tamo in Japanese). As I got to see many examples up close, and learn about how they are made, and about their design, I realized tenkara nets are just masterpieces of simple organic, yet functional design. Each net is a work of art and I’m surprised I haven’t run across one at a museum somewhere. True, I haven’t been this excited about something since I discovered tenkara rods. One of the main reasons for their appeal is the fact that tenkara nets are made out of a single branch of a tree. How much simpler can it get? No carving, no manufacturing, a simple, organic, tree branch selected and used to make a strong, and functional net frame. Of course, simplicity doesn’t always mean easy, and in this case it definitely does not. A good tenkara net is very hard to make, and it takes a long time to finish. The process of making a real tenkara net starts with the selection of the wood; this is the most important step, and the defining one in the process. A tenkara net craftsman will spend days walking in the woods in search of the branches that will work well for making a net. He’ll look for just the right branch with the right angles and diameters. After I learned how these nets are made, I have spent a lot of time looking up to trees, trying to identify those branches that may offer the right angles for a net, and they are really not easy to come by, at least not to the untrained eye. As a result, every single net will be a completely unique piece, with lots of effort put into each one. Traditionally tenkara nets are made with branches from the kaya tree (Torreya nucifera), a relatively rare type of conifer tree found in southern Japan and an island in South Korea. The trees are a protected species; they are slow growing trees, confined to a small area; thus, any branches that are found are even more highly prized. 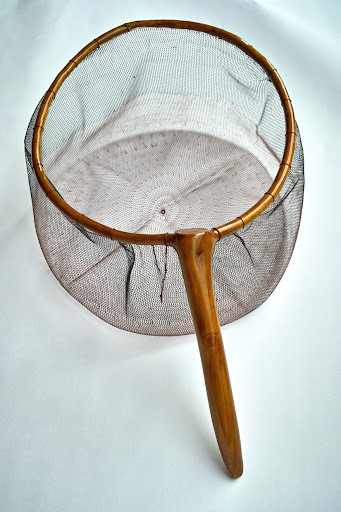 While I believe many other trees may work, the kaya seems to be ideal for these nets, it’s durable and hard yet lightweight, the wood has interesting patterns and a uniform grain. 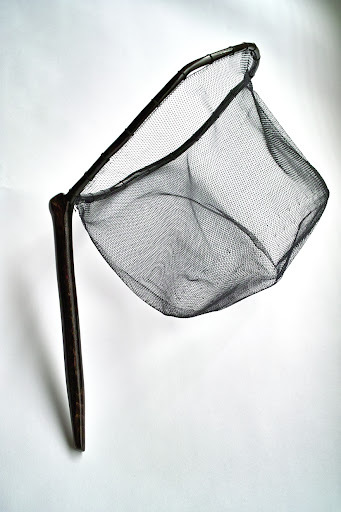 One of the nets I purchased, a slightly “large” one with a longer handle weighs a mere 3.5 oz. 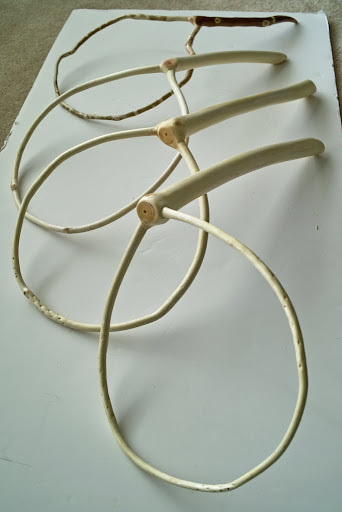 Occasionally bamboo is also used, though bamboo is not as durable for this application, and more difficult to work with, so makers tend to prefer wood branches. In Gujo, Gifu prefecture, we visited a shop that specializes in tenkara nets. The store is run by the artisan and his wife and almost all nets are made by him. It is one of the few places in all of Japan that makes and carries thems. It’s a wonderful display of unique and authentic tenkara nets, some simple and functional, some with unique wood features, and some featuring ornamental deer antlers, which are said to protect anglers in the water. Yes, I did feel like a “kid in a candy store”. Tenkara nets are just perfectly designed, even though no one ever really designed one, and even though I’ll suspect no tenkara net is never really “perfect”. As a matter of fact, imperfections are more than welcome on the nets, there is no need for the frame to be perfectly leveled or for the wood to be free of “flaws”. This may actually be their allure. The natural aspect of each branch is fully embraced by the maker, and by the angler. I think the concept of wabi-sabi applies well here. I have always been a big fan of Japanese design, and with so much inspiration from all aspects of life, even fishing, it’s no wonder Japanese design tends to be so clean, and functional. The round shape of the net comes from the way the nets are made. 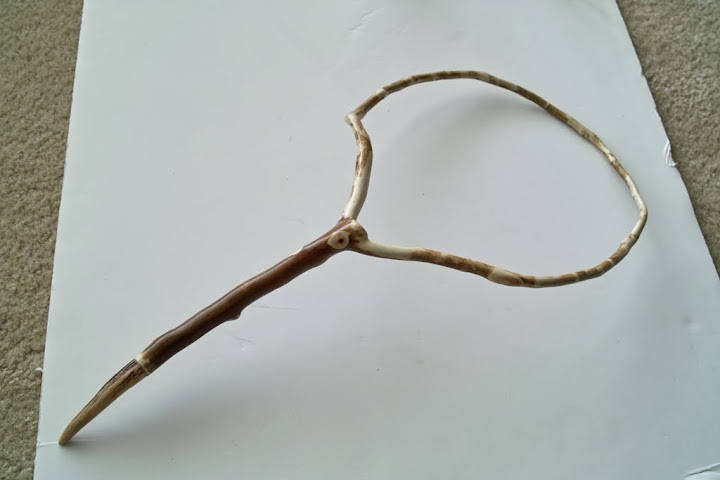 Essentially one gets a branch that is Y-shaped (normally a trident shape, where the middle branch is cut off), and through a process of drying and steaming the wood, as well as forcing it into shape, bends the net frame into a circle. The reason for a circle shape is simple, a circle is the strongest shape that can be made to receive pressure or hold weight. Thus, a good circle is also a good indicator of the quality of the net. The circular frame is the best shape to uniformly distribute the pressure a fish puts on the frame, as well as on the net mesh. The angle between the net frame, and the handle, is also an important functional attribute. As I experienced, this angle is supposed to help in a few ways. When wearing a wading belt (or a regular belt for that matter) the angle keeps the mesh and frame off one’s back, thus allowing the angler to move freely as he walks or climbs over a rock. Further, the longer handle usually found on a tenkara net along with that angle allows for the handle to be held behind the knee as one is kneeling on the water, while having the net and fish facing slightly forward. This allows for the tenkara angler to have both hands free as manages the fish, removes the fly, and yes, takes a picture. If one is wading a bit deeper, the same may be done by having the net held by the wading belt, or even under the arm pit as he manages the fish at a comfortable angle and with both hands. Yes, ingenious design! Click below for some very instructive web pages (in Japanese) on making the nets.